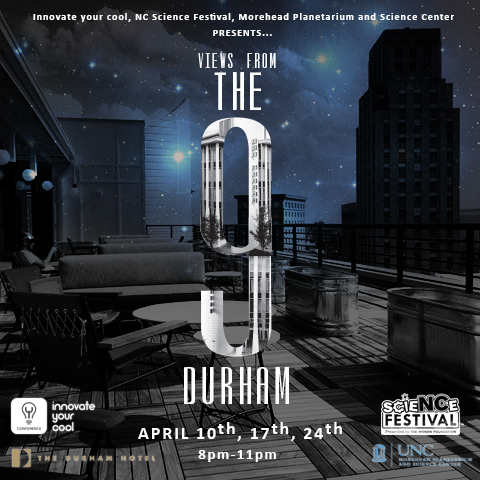 Join us on the roof the last 3 Mondays in April for night sky telescopic views and science exhibits with music and cocktail specials hosted by the Morehead Planetarium and Science Center and The NC Science Festival. The bright full moon will be center-stage with planets and deep sky objects also visible. Viewers will get a dark look at the skies over Durham including planets, nebulae, and galaxies. Early in the session, the red planet – Mars—will be visible low near the western horizon. The king of the planets – Jupiter – will be our most prominent object throughout the evening. Planets loom large in our solar neighborhood, but tonight we will extend our view to objects deep in the sky. Galaxies, nebulae and star clusters will be the focus of the night.